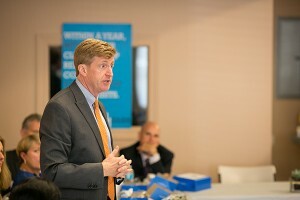 Chicago, IL – Former US Congressman Patrick Kennedy visited Thresholds’ Bridge South and New Freedom Center South today to see community-based mental health services in action in Chicago. Former Congressman Kennedy recently announced the Kennedy Forum, a new initiative marking the 50th anniversary of President John F. Kennedy’s signing of the Community Mental Health Act, a landmark bill that provided the framework for modern mental health policy. The Kennedy Forum will formally begin this October with a conference and gala, and aims to unite the mental health community with common purpose. Joining Patrick on his visit to Thresholds were partners from UIC College of Nurses, NAMI Greater Chicago, Community Counseling Centers of Chicago, Neumann Family Services, Be Well Partners in Health, and MADO Healthcare Centers. Thresholds’ Bridge South, located in Chicago’s New City community area on the south side, provides a variety of care and programming for Thresholds clients. While most Thresholds services are provided out in the community, the location at Bridge South also includes an on-site integrated health clinic that provides primary healthcare and psychiatry services through a longtime partnership with the UIC College of Nursing. The clinic allows clients’ mental and physical healthcare to be managed and coordinated seamlessly, which is critical to improving health outcomes in persons with serious mental illness. 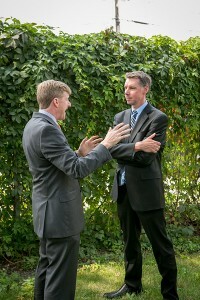 Congressman Kennedy also visited Thresholds’ New Freedom Center South, a drop-in center funded by the Department of Mental Health that provides peer support and social opportunities for persons who are transitioning out of nursing homes and IMDs into independent living in the communities of their choice. Thresholds operates two other New Freedom Center locations in Kankakee and the north side of Chicago. In the past year, Thresholds has assisted nearly 200 clients as they transition to community-based care through the Williams Consent Decree. As a member of Congress, Patrick Kennedy was instrumental in the passage of the Mental Health Parity Act, which brought mental health more firmly under the coverage of insurance providers. The Kennedy Forum will return to Chicago to hold a future event. About Thresholds: Established in 1959, Thresholds provides healthcare, housing, and hope for thousands of persons with mental illness in Illinois each year. Through care, research, employment, advocacy, and housing, Thresholds assists and inspires people with mental illness to reclaim their lives. Thresholds is the oldest and largest provider of recovery services for persons with mental illnesses in Illinois. They offer 25 innovative programs at more than 70 locations throughout Chicago, the adjacent suburbs, and McHenry and Kankakee Counties. Services include assertive outreach, case management, housing, employment, education, psychiatry, primary care, and substance abuse treatment. Last year, Thresholds served 6,100 adults and youth, with 75% of services delivered out in the community, representing more than 400,000 hours of care. For more information, please visit www.thresholds.org or follow @thresholdsctrs on Twitter. For more information about the Kennedy Forum, visit www.thekennedyforum.org or follow @kennedyforum on Twitter. This entry was posted in News and tagged kennedy, mental health, news, patrick kennedy, press release. Bookmark the permalink.